Liquid Crystal is actually a combination of the solid and the liquid. They have both the properties of solids and liquids and maintain their respective states with respect to another. Solids usually maintain their state, unlike liquids that change their orientation and move everywhere in the particular liquid. A liquid crystal cell consists of a thin layer (about 10 u m) of a liquid crystal sand­wiched between two glass sheets with transparent elec­trodes deposited on their inside faces. If both glass sheets are transparent then the cell is known as transmittive type cell. If one glass is transparent and the other has a reflective coating then the cell is called reflective type. The LCD needs an external source for its visual effect. When a potential difference is applied across the liquid crystal molecules, they tend to untwist. This changes the angle of light passing through them. The polarising filter changes the angle of light passing through it. So only a little light is allowed to pass through that particular area of LCD. Thus that area becomes darker comparing to others. 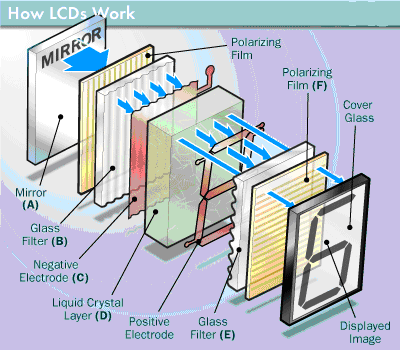 Types of LCD (Liquid Crystal Displays). 1. The requirement of a light source.